A floral start on the nose with vanilla and toffee notes behind. Slightly creamy and somehow buttery. Some citric fruits emerge, followed by ginger and a whiff of coconut in the back. Sweet on the palate with vanilla and toffee, accompanied by acacia honey. This is followed by a warming spiciness of oak, ginger, white pepper and subtle nutmeg. The spiciness fairly increases with a second sip. The finish is pleasantly long, warm and creamy - even flowery. Toffee and some dry notes of oak towards the finish. A few drops of water bring more flowery notes to the fore - geranium in particular. Vanilla and citric fruits, however, are significantly tamed. Still sweet on the palate with vanilla, toffee and honey. Slightly warming with a creamy touch of nutty flavours towards the finish. But where's the nice spiciness? It's completely gone! The finish is noticeable shorter with creamy notes of toffee, vanilla and honey. No sign of flowers anywhere. A flavourful but not overpowering single malt from Finland. Lovely vanilla and toffee notes from the bourbon casks, nicely balanced with a pleasant warming spiciness. To me, there's only little influence of the sherry casks. A young but already good drinkable dram. But please, don't add even one drop of water! 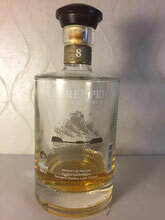 I am quite curious how single malts from Teerenpeli will taste with older age.